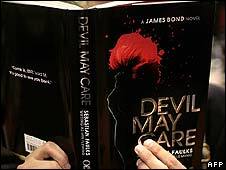 There are no plans to make the latest James Bond novel, Devil May Care, into a movie, 007 filmmakers have said. Producer Barbara Broccoli, of Eon Productions, told Variety magazine the company "loved" the novel, written by Birdsong author Sebastian Faulks. But "because it is set in the 1960s, we haven't considered making it in the near future", she added. The book, published in May to mark the centenary of the birth of Bond creator Ian Fleming, won rave reviews. A spokeswoman for Eon said it had not ruled out a future Devil May Care film. Faulks had previously said Eon liked the book but that it was up to them if they made it into a film. The author, who is best known for historic novels including Charlotte Gray, was selected by Fleming's estate to write the centenary novel. As part of his research, Faulks read all the original Bond stories to capture Fleming's style. The book become publisher Penguin's fastest-selling hardback fiction title, selling 44,093 copies in its first four days of publication. By comparison, previous Penguin best-sellers by Tom Clancy and Nick Hornby have sold about 11,500 copies in their first four days.